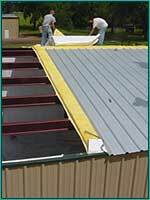 A steel building from Metal Building Depot is the most economical building choice you can make. Our steel buildings are long lasting and trouble free. Steel is stronger and more resilient than conventional building materials. Our steel buildings are more economical than conventional methods due to the originating costs and reduced labor. Complete steel buildings are delivered to the jobsite and quickly erected. It is easy to enlarge a building by removing the end walls, erecting new framework and adding matching wall and roof panels. In most situations, the original end wall panels can be reused.